How are the Eurozone and UK economies doing since Brexit? Home > Blog > Is the UK really "shackled to a corpse"? Incoming data suggests that the Eurozone’s economy continued to fire on all fronts in the third quarter of 2017. Industrial production surged in August, and economic sentiment surged to the highest level since 2001 high in October. In addition, the unemployment rate hovered at a multi-year low in August and robust external demand has boosted exports, despite a strong euro. All-in-all the economy is on track to record the fastest annual growth since before the financial crisis. On the political front, the situation has become more turbulent in recent weeks, which could increase uncertainty in the region. In Spain, an independence movement in Catalonia has led to clashes between regional authorities and the central government. Escalating tensions along with public demonstrations could take a toll on economic activity in the region in the coming weeks. Meanwhile, Austria shifted to the right in its 15 October elections, and Brexit negotiations have yielded little progress so far. The UK economy continues to chug along, with both the manufacturing and services PMIs staying well in expansionary territory in September, and the unemployment rate at a multi-decade low. However, consumers are still smarting as higher inflation digs ever deeper into real wages, evidenced by disappointing retail sales in September. In order to boost the purchasing power of young people, the government recently promised GBP 10 billion to help them purchase a home, and announced a more generous system of tuition fee repayments. Clarity over how these new spending measures will be funded should come in November’s budget. On the international front, Brexit negotiations are at an impasse. In September, Prime Minister Theresa May outlined proposals for a two-year transition period, during which time the UK would enjoy unfettered access to the single market. However, talks on such a transition deal are yet to begin, with both sides still locking horns over a financial settlement. The longer the preliminaries drag on, the thicker the fog of uncertainty becomes, with consequent risks to investment. 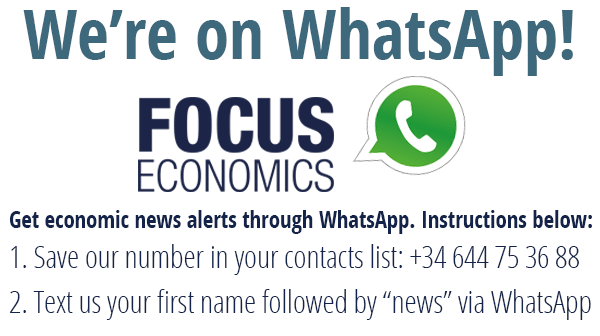 If you'd like to get more data, written analysis, Consensus Forecasts on 30+ macroeconomic indicators for 127 countries, click on the button below to download a free sample of the FocusEconomics Consensus Forecast Report.